Primeval and creator god according to the theology of Heliopolis. At the beginning of creation he created himself out of the primeval waters of Nun (in some texts called his father) and appeared on the primeval hill. He then began his work of creation. By masturbating, or in other versions by spitting, he created the first pair of gods, Shu and Tefnut. Eventually the Ennead of Heliopolis was created. Although Atum is also the sun god, just like Re, they were at first separate gods. Nevertheless, the Pyramid Texts from the Old Kingdom already combine the two gods into Re-Atum. The Egyptian priests linked the various sun gods to different phases of the sun. Thus Khepry became the morning sun, and Atum was regarded as the evening sun (the word 'itmu', from which the name is derived, means 'to complete oneself' in Egyptian) or 'Re on the top of the western mountain'. In a spell in the Book of the Dead, Atum relates that at the end of time he will destroy everything he has created, and that the world will return to the primeval situation from before creation and become an inert mass of water. 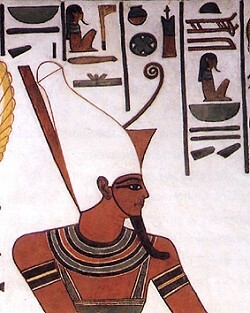 There Atum, having turned himself into a snake, will live with Osiris.